Join us in welcoming Campus Cycles as presenting sponsor for the 2019 Littlefoot Sprint Triathlon! Campus Cycles is a full service bike shop, conveniently located near DU in Denver. Campus has been our family's go-to bike shop for the past decade! From training and racing bikes for me, to Jill's fun trail bike, to kids bikes (and young adult bikes) for my daughter, Campus has us covered - and their service department is the best I have worked with! Between now and race day, Campus can help you with bike repairs, clothing and tubes, a bike fit, or that all important pre-race tune-up! Be sure to stop in and check them out!!! CLICK HERE TO VISIT THE CAMPUS CYCLES WEBSITE!!! 750 METER SWIM COURSE (click for map)The swim follows a triangle shaped course in Soda Lake, starting and finishing at the Bear Creek Marina. The swim will go off in waves at 10 minute intervals to spread rides out on the bike course. Swimmers will exit the water via the paved boat ramp. Carpet will guide you to transition. 15K BIKE COURSE (click for map) The 15k bike course is a rolling route that takes riders on a fun tour of the park, offering great views of its two lakes and the foothills to the west. 5K RUN COURSE (click for map) The 5K run is a gently rolling out & back route on the scenic bike path that meanders through Bear Creek Lake Park. TRANSITION (click for map)Transition will be located in the Marina parking lot, adjacent to the expo area and finish line. Racing Underground has been producing running and multisport events in Colorado for more than 20 years. You can expect a professionally managed and safe event, and a great value for your entry dollar. Your entry will include a fun late season triathlon, a high quality technical shirt, a catered post-race meal following the race, speedy results from the best timer's in the business, and FREE race photo downloads. Every effort will be made to hold the race, regardless of weather conditions, however we reserve the right to alter or shorten the course in the case of extreme weather. Once accepted, entry fees will not be refunded for any reason. You may cancel your entry and receive a 75 percent credit toward any other Racing Underground event until 30 days before race day or until the race sells out, whichever comes first. The credit will be valid for 12 months. You may transfer to another athlete for a $10 fee until 10 days before the event. No transfers will be allowed fewer than 10 days before the event. No refunds or credits will be issued if the race is shortened, postponed, or cancelled due to weather. Race Morning Packet Pickup will be available beginning at 5:30am. You must pick up your packet in person, and you must present a valid Photo ID in order to pick up your packet. If you are a current USAT member, you must show your valid USAT membership card or you will need to pay the $15 USAT One-Day fee. If you are not an annual member of USAT, you will need to pay the $15 USAT one-day fee unless you did so during registration for the race. Most non-members have pre-paid that fee during registration. Early Packet Pickup will be held on Thursday September 12th from noon until 6:00pm at Campus Cycles, located at 2102 S. Washington Street in Denver. The Campus Cycles service department is second to none! Be sure to have them give your bike a tune-up before the race. It's where I get mine serviced! ***Friends and family may pick up your packet for you at Thursday's early packet pickup, however they will need a note from you, a copy of your valid USAT card (if applicable), and you will need to present a valid photo ID on race morning in order to pick up your timing chip. No exceptions. ***All Relay Team members must show a valid Photo ID on race morning. Be sure to stick around after the race, and enjoy a pancake breakfast from Flippin' Flapjacks! Overall Awards: The top-3 overall male and female winners will take home merchandise awards from our amazing sponsors! Age Group & Category Awards: The top-3 male and female finishers age 13-15, 16-19, and in all 5-year age categories beginning with 20-24 will receive an award. Overall award winners will not be eligible for age group awards. Awards will also be presented to the top-3 Clydesdale & Athena finishers. The first place relay team in Male, Female, and Coed categories will win a relay award. 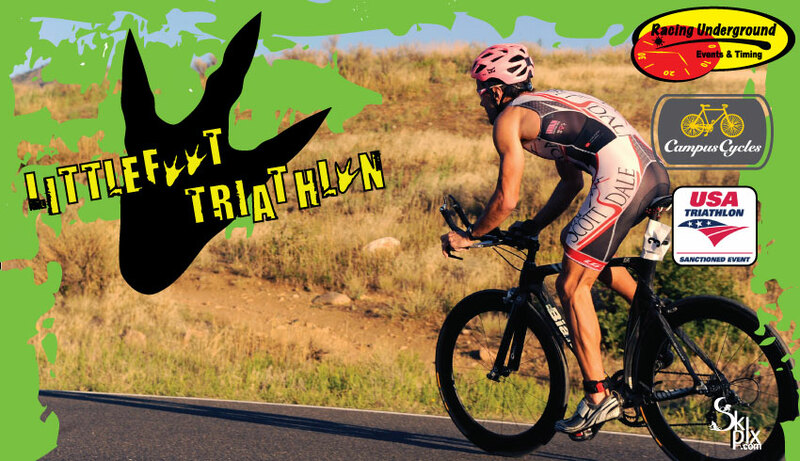 The Littlefoot Triathlon takes place at Bear Creek Lake Park in Lakewood, just a mile from downtown Morrison. Please be aware that some of the map websites that provide directions will send you to the wrong side of the park, where there is no entrance. The park is easy to find, however. From C-470, exit at the Morrison Road exit. Head east on Morrison Road about a quarter mile, and the park entrance will be on your right. For those of you who would like to take your chances online, the park address is 15600 W. Morrison Road, Lakewood, CO 80465. Once you have passed the entry station, turn right at the 3-way intersection and follow the road approximately 1 mile. Race parking will be in the swim beach lots (there are two of them). From there, it is a 2 minute walk south on the park road to the transition area in the marina parking lot. All spectators must be in the park, and in a parking space by the 7am start time. This is for the safety of the cyclists, and to ensure that the riders have an open road. The only road that leads to race parking is the bike course. Please be sure your spectators understand that it is important for them to arrive by 7am. Colorado's leader in event production and timing!